Downing Street has sought to play down a warning from a government source that the House of Lords could be abolished if peers try to block the Brexit bill. The bill - to give the government the authority to trigger Article 50 - was approved by 494 votes to 122 in the Commons, and now moves to the Lords. A government source said the Lords will face an "overwhelming" public call to be abolished if it opposes the bill. Brexit Secretary David Davis called on peers to "do their patriotic duty". Prime Minister Theresa May wants to invoke Article 50 - the starting gun on the two-year process of the UK leaving the EU - by the end of March. However, after a Supreme Court ruling last month, she first requires Parliament's permission. Mr Davis said the government had seen off a series of attempts to amend the European Union (Notification of Withdrawal) Bill before MPs overwhelmingly voted on Wednesday in favour of passing it unamended. The bill must now be approved by peers, who will begin debating it after the Lords returns from recess on 20 February. The Liberal Democrats have vowed to continue trying to amend the legislation after it comes to the Lords, while pro-Europe Tory and Labour peers may also try and make changes to the bill. Mr Davis said he expected the House of Lords to "do its job and to do its patriotic duty and actually give us the right to go on and negotiate that new relationship". However, a government source told BBC political editor Laura Kuenssberg on Wednesday: "If the Lords don't want to face an overwhelming public call to be abolished they must get on and protect democracy and pass this bill." On Thursday morning a No 10 source distanced Downing Street from that view, saying peers had an important role in scrutinising and debating the bill "and we welcome them exercising this role". BBC assistant political editor Norman Smith said: "It suggests ministers are mindful that threatening peers may simply fuel opposition - and prompt a constitutional clash - that would be a massive distraction from delivering Brexit." Shadow business secretary Clive Lewis was one of 52 Labour MPs to defy party orders to back the bill in the Commons and he resigned from the front bench. He said he could not back the bill, given his Norwich constituency voted 56.2% to 43.8% to remain in the EU in June's referendum. 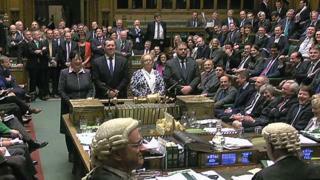 Eleven Labour junior shadow ministers and three party whips also voted against the bill. Leader Jeremy Corbyn said he understood the difficulties the vote presented some of his MPs but said they had been ordered to back the Article 50 because the party would not "block Brexit". 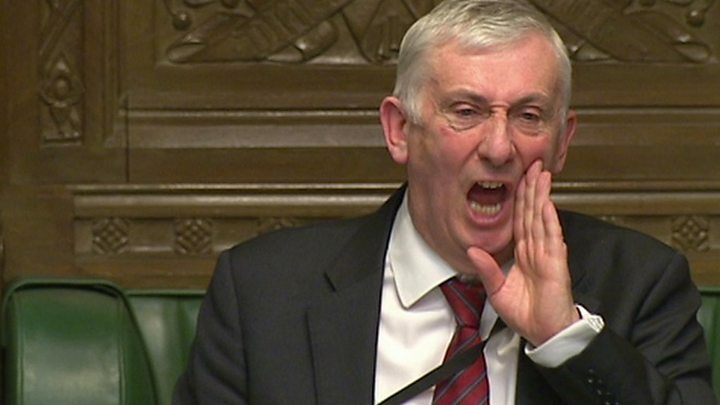 Media captionDeputy Speaker Lindsay Hoyle said he did "not want a sing-off within the chamber"
Mr Corbyn will make decisions on whether to sack frontbenchers who defied the whip and who will replace the shadow cabinet ministers who resigned in the next few days, a Labour source said. 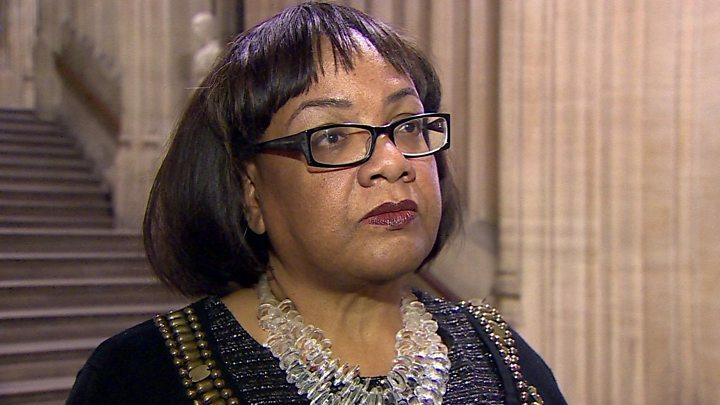 Shadow home secretary Diane Abbott, who last week blamed a migraine for a failure to attend a key vote on the bill, backed the triggering of Article 50. She told BBC's Newsnight: "I respect the result of the referendum and no-one wanted to thwart it in a perverse kind of way. "But we need to be clear, this is not a Tony Benn Brexit, this is Donald Trump Brexit, and it's got a very ugly side." Former Chancellor Ken Clarke was again the only Conservative to vote against the two-clause bill. Earlier the bill survived several attempts to change its wording and add extra conditions. These included Labour MP Harriet Harman's bid to protect the residence rights of EU citizens in the UK, which was outvoted by 332 votes to 290, with three Conservative MPs rebelling.